During summer, I want easy recipes using the fresh produce that isn’t around come January in Chicago. I also want to grill as much as possible. It’s a caprese salad, the classic Italian salad with colors meant to resemble the Italian flag, with the tasty addition of grilled eggplant. The eggplant makes this a more substantial side or appetizer, or even a light meatless meal. When you have IBS, large servings of vegetables can be hard to digest, but caprese gives you that salad experience without a big bowl of lettuce and raw veggies. If you’re sensitive to vegetables, start with a small serving and see how you feel! Looking for more low-FODMAP grilling recipes? Check out Lemon-Caper Fish and Veggies Grilled in Foil Packets or the Grilled Steak with Chimichurri Sauce! This salad works best with flavorful tomatoes in season - If you grow them or have access to a farmer’s market, that’s the way to go! I used heirlooms, but common varieties are great too. Pair with sourdough bread or another grain for a light meatless meal. You could also add prosciutto or chicken to the salad for extra protein. 1. Prepare a charcoal or gas grill (medium-high for gas). Coat both sides of eggplant rounds with cooking spray (or brush with oil) and season with salt and pepper. Grill until very tender, 16 to 20 minutes, turning 3 to 4 times during cooking. 2. Arrange 3 eggplant slices (you may have some leftover) on each of four plates. Top evenly with mozzarella and tomatoes. Drizzle each plate with 1 tsp each extra-virgin olive oil and balsamic vinegar. Season tomatoes with sea salt. Garnish with basil and serve. Tip: Want to make sure your fresh mozzarella is low lactose? Look at the “Sugars” line on the Nutrition Facts label. Lactose shows up as sugar in dairy products, so if it says “0 g” you know it’s low-FODMAP. This works for any cheese, as long as there are no added sugars in the ingredient list (honey, for example), which there shouldn’t be unless it’s a flavored cheese product. 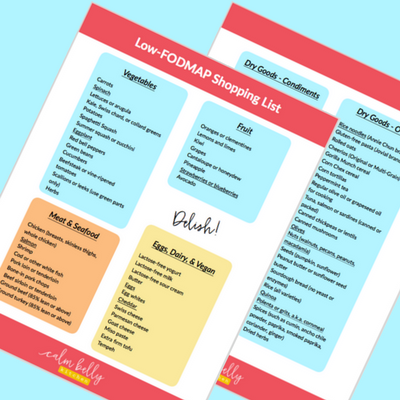 >>> Need to make food shopping on the FODMAP Diet a little easier? I created a free shopping list of everyday food you can find at most supermarkets (plus links to some of my favorite low-FODMAP recipes!). Click to grab it! I'm a big fan of "go-to" recipes. If you've been part of the email crew for a while, you might remember me talking about this in a past newsletter. To sum it up, you've got to have easy, no-brainer recipes you can make even if you're totally exhausted and didn't do any planning beforehand. 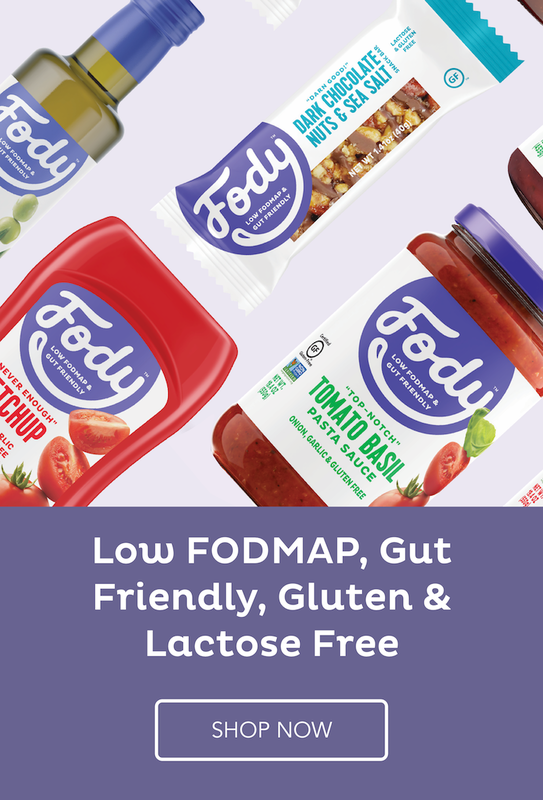 For a lot of women I talk to, starting the low-FODMAP diet (or ANY specialized healthy eating plan) means you're suddenly cooking every bite of food that goes in your mouth. So not only do you have the challenge of a restrictive diet, but you have to learn a whole new skill set to go along with it. And watching a few episodes of Giada (or Guy Fieri, if that's your jam), isn't going to cut it. Here's my advice: Don't start bookmarking complicated recipes online and trying to make a new and exciting dish every night of the week. Instead, start with the basics. Use as a marinade for chicken, beef or pork. Use as a sauce for any kind of seafood (shrimp, salmon, scallops, white fish). Toss with cold leftover quinoa, sorghum or gluten free pasta. Drizzle over grilled, steamed or roasted vegetables (eggplant, potatoes, zucchini, bell peppers, green beans, broccoli). Use it on a salad, but get creative with your greens. Try arugula, butter lettuce, baby kale, radicchio, endive or frisée. To make a really tasty (and super versatile!) dressing you only need 4 ingredients. Plus salt. But here's the real kicker: The measurements don't need to be exact. Once you do this a few times, you don't need to bother with measuring spoons unless you want to. The measurements I'm giving you are great place to start. Can you make substitutions (lemon juice instead of vinegar, for example)? Can you add stuff (herbs, spices)? Yes and yes. You cannot mess this up. If you don't think your creation tastes quite right, tweak away until it does. I personally like a higher proportion of acidic ingredients than most traditional vinaigrettes contain, so that's how I make it! This recipe makes 2 good-sized entrée salads. You can make half the recipe for a single meal, but why not make the whole thing and save half for lunch the following day? Put a serving of vinaigrette in a little jar so you can take it with you on the go and dress your salad when you're ready to eat--no soggy greens! I like adding chicken to this salad (I broil a big batch of chicken breasts every few days and use them for everything), but any protein works here. A great meatless option would be quinoa or sorghum. Note that the vinaigrette recipe makes enough for 4 servings. It keeps in the refrigerator for several days. 1. Add all the vinaigrette ingredients to a jar with a tight-fitting lid. Shake it up until combined (or emulsified if we're fancy). Taste and adjust as you like. 2. Add spinach, strawberries, olives, sunflower seeds and black pepper to a large bowl. Add 4 to 5 tbsp of the vinaigrette (a little less than half of the recipe). Toss well and add more vinaigrette if needed. Remaining vinaigrette will keep in the refrigerator for several days. 3. Divide salad between two bowls and top with sliced chicken. Sprinkle with feta and enjoy. -I also use a little somethin' sweet in my vinaigrette. Sugar (I usually just use the plain old white stuff) creates a more complex, balanced flavor. You can use any type of sweet stuff you like. Maple syrup is great, and it's an emulsifier too! This refreshing main dish salad is a classic French recipe that is naturally low in FODMAPs!